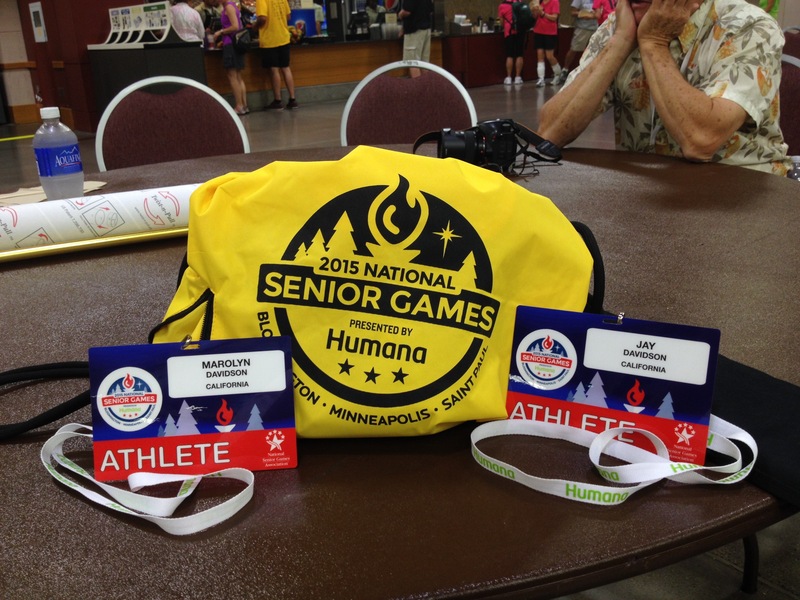 NATIONAL SENIOR GAMES, MINNEAPOLIS, MINN. In June, 2014, Marolyn and I, along with several friends, went to Pasadena to play in the California Senior games Shuffleboard tournament, Hosted by John and Barbara Irogoyen. John is also a CSA District President. As is usual with shuffleboard, we met new people, renewed friendships and generally had a fine time, both during and after play. 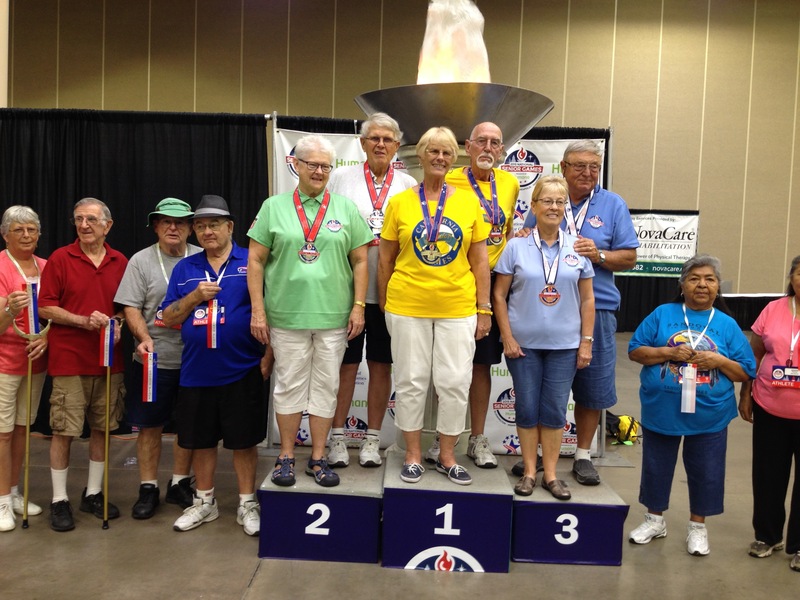 Winning a medal in this tournament qualified us to participate in the National Senior Games as a California “athlete”, to be held in July 2015 in Minneapolis. Now the Road Trip part. After weeks of planning and preparing for our parks (Hemet West) annual 4th of July day of fun, food and games, on Saturday, Sunday and Monday we rested, packed and packed some more and bright and early Tuesday (8:30) morning we set off for Minnesota. Through Las Vegas, through the beautiful Virgin River Canyon and north to Beaver Utah the first day, The second day we took I-70 over the Rockies, past Vail and into Denver. This was by far the most scenic day of driving on the whole trip and I recommend it if you have a chance. Then across the plains to Omaha and north to Minneapolis. We roomed at the Super 8 in Bloomington along with 4 other couples. The price was fair and it was close to The Mall of America. We didn’t take into account that the games were downtown in the Convention Center and the 10 mile way there was the busiest freeway in Minneapolis. And parking was $10 a day. At the Athletes Village on Friday evening we found that we could buy a weeks pass for the bus for $8 and that it picked up at our motel. The 55-69 age groups ended Friday and Saturday was practice for 70 and up age groups,so we rode the bus to see how it would work out. 45 minutes and dropped us at the door. After practice we visited the Mall of America. Quite a place. 3 floors of shops and restaurants. 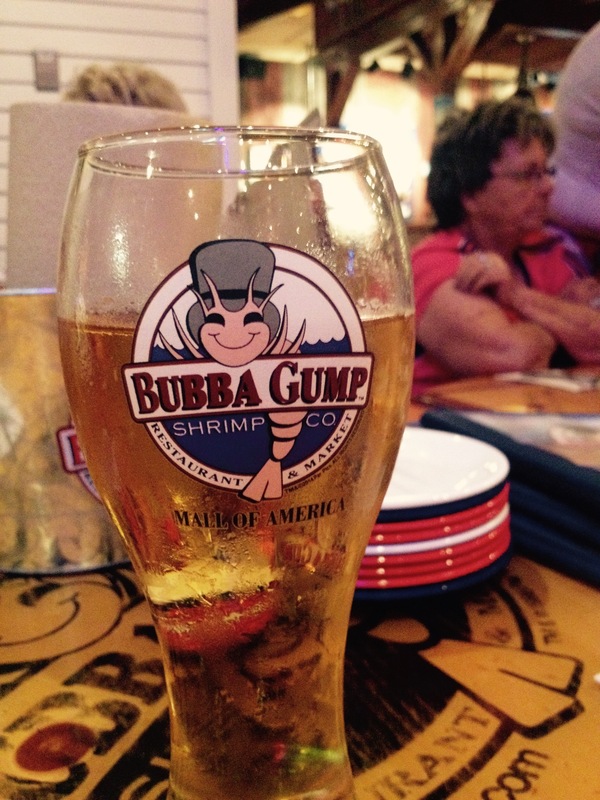 We went to Bubba Gumps. 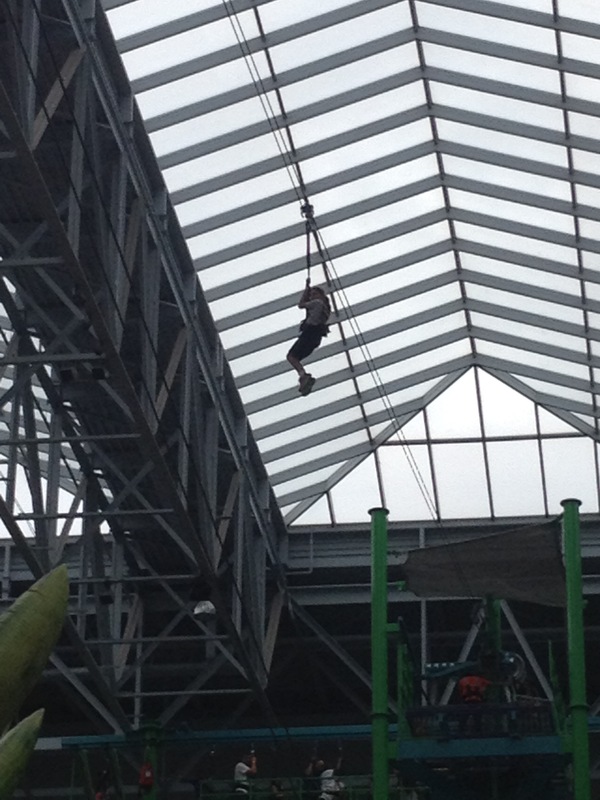 One of our groups 8 year old granddaughter was with us and she zip-lined over the amusement park in the center of the mall. Scary! Sunday was the first day of singles. Both men and women and all age groups. First game at 8:00 and last game at 5:00. 7 time slots in all. A long day and just the first one. I think this was where the “athlete” part came from. The larger the number of entrants in a group, the more games you had to play to qualify for the 8 spots in the final 3 games. Marolyn had 5 games the first day, 2 the next morning, and then the 3 game finals Monday afternoon. I had 4 on Sunday, 2 Monday morning and the 3 finals games Monday afternoon. The qualifiers were 12 frames and the finals were 16 frames Marolyn got 6th 70-74. I got first 75-79. We were worn out and we had to start the doubles at 8:00 Tuesday morning. Rob Robinson ran the event in his usual excellent fashion. He had help on the computing end from Kathleen Cullop of PolyGlide. Board maintenance and court dressing were supplied by Mike Walker of Dura Dress. Rob let us start the next game as soon as all players for that board were present so we were able to finish each days play shortly after 5:00. 10 minutes to a half hour wait for the bus, 45 minute ride back to the motel. quick trip to the restaurant, in the room by 7:00 Asleep by 8:30! Up at 4:45. In the breakfast room at 6:00. Catch the bus at 6:36. Arrive at 7:20. Start the doubles at 8:00. The Doubles went a little faster because the 16 frames were counted 8 from each end. Games didn’t last as long and we were able to rest a little between them.Wednesday afternoon the games finished early. Marolyn and I were able to win the largest age group, 70-74. We caught the bus by 4:30. On the ride back we all gave away what was left on our passes to people that we saw pay cash for their ride. We were just glad that we didn’t need them any longer. Back early, we were able to have a nicer more leisurely dinner and stayed up till 9:00! There was so much going on during the 2 weeks of the games that maybe we should not play 2 years from now but just go and see it all. Opening ceremonies, athletes parade. Track, swimming, bowling, baseball, etc. On the road again Thursday morning. A 10 hour drive to Rapid City, SD. Gained an hour so that helped. After the miles of prairie that just keeps repeating itself, the hills are really something. We passed by Walls Drug but didn’t stop. The motel manager gave us maps and highlighted all the roads for us to visit Rushmore, Crazy Horse, Custer National Forest and several very scenic roads between all of the major places. The Black Hills are truly magnificent. Saturday we drove more scenic roads and towns, Deadwood, Leadville, and stopped and bought a tee-shirt in Sturgis. 2 weeks until the motorcycles arrive. Sunday to Rock Springs, Wy. Monday to Saint George, Ut. Tuesday to Home Sweet Hemet West. Quite a successful trip in all.